Home > The Bookstore > The Pocket R. L. S.
New York: Charles Scribner & Sons, 1905. 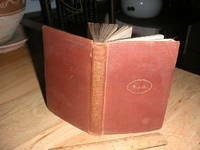 Brown cloth hard cover w/gilt spine & cover lettering, spine deco, 217 pgs. w/gil tpe. War Service Library sticker inside cover, Dept of Defense City of New York stamp pg.15. Binding is fim, previous owner name under war sticker, Covers moderate wear. Size: 24mo - over 5" - 5¾" tall. Hard Cover. Good/No Jacket. Title: The Pocket R. L. S.